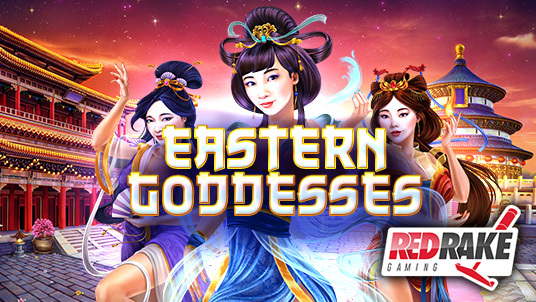 Red Rake Gaming, the company that develops high quality Casino games, has announced its latest Html5 release, Eastern Goddesses. On this occasion they are taking us to the East via a spectacular Html5 video slot machine with 5 x 30 reels and 30 betting lines which will star three beautiful Goddesses. The key aspect of this new video slot machine are its three different mechanics, each implemented by a goddess and corresponding to three of the main elements of nature, FIRE, WATER AND WIND. Through these powers each Goddess appears in the game taking up the entire reel and activating their mechanics through appealing animations that will make the player win spectacular prizes. As we are now accustomed to with Red Rake Gaming, music is another of the strong points of this video slot machine. Its evocative oriental melodies induce states of ecstasy as well as relaxation in the player, to create a unique experience. This is a video slot machine filled with magic and sensations that will certainly be a great success among players.